RDA Hunter’s Investing in Women project celebrated 2019 International Women’s Day with a series of informative and practical Women in STEM activities across the Hunter region. The activities involved over 240 Year 7 – 9 female students from nine (9) Hunter region ME Program schools across four-days. The program included workshops with Tech Girls are Superheroes founder, Dr. Jenine Beekhuyzen, a careers session run by industry partners, Boeing Defence Australia and an industry visit with Port Waratah Coal Services. Participating schools included Maitland High School, St Joseph’s College – Lochinvar, Warners Bay High School, Cardiff High School, Newcastle Grammar School, San Clemente High School and the Greater Barrington STEM Community consisting of Dungog High School, Gloucester High School and Bulahdelah Central School. The Greater Barrington STEM Community participated in a two-day workshop which involved the careers session with Boeing Defence Australia, the industry visit to Port Waratah Coal Services and launch of the Tech Girls are Superheroes competition. The careers session facilitated by Boeing Defence Australia included talks from Olivia Hutchinson, Jade Roesing, Fiona Wong and Emma Watson who all have different backgrounds within the business. The session inspired the students to work hard at what they enjoy, and that STEM careers are not only based on the individual subject areas but encompasses everything from communicating, problem solving and collaboration. 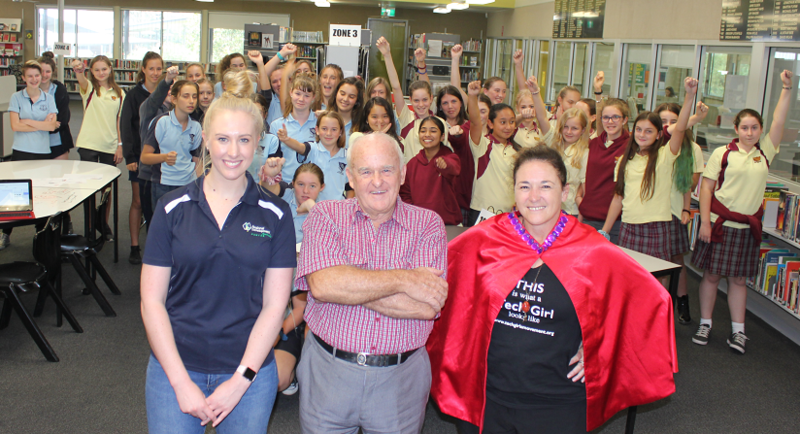 Dr. Jenine Beekhuyzen launched the 2019 Tech Girls are Superheroes competition in the Hunter on the 8th of March, International Women’s Day through the workshops with 60 students from the Greater Barrington STEM Community. The Tech Girls are Superheroes workshops aim to get students not only interested in STEM subjects but also the entrepreneurial side of technology and breakdown the stereotypes which prevent more girls taking up STEM subjects. “The girls in the workshop were highly engaged, in part because they were able to choose the problem they wanted to solve, and then because they had the ability, with our help, to create a real-life solution to it. There was such a variety of problems they wanted to solve,” said Jenine. Feedback from a participating student said technology has always been an interest for her in STEM but the careers session inspired her to continue working hard at what she enjoys. RDA Hunter’s Regional Development Co-ordinator, Sarah Kane said it was important for girls to have the opportunity to take part in such workshops. RDA Hunter’s Women in STEM activities are a way of engaging young women to inspire them to study STEM subjects at school and pursue STEM based careers. The 2019 program was made possible by the support of the Department of Defence for RDA Hunter’s ME Program and the NSW Government’s Investing in Women program through the Department of Family and Community Services.